The most famous holiday street in San Carlos did not disappoint last night. 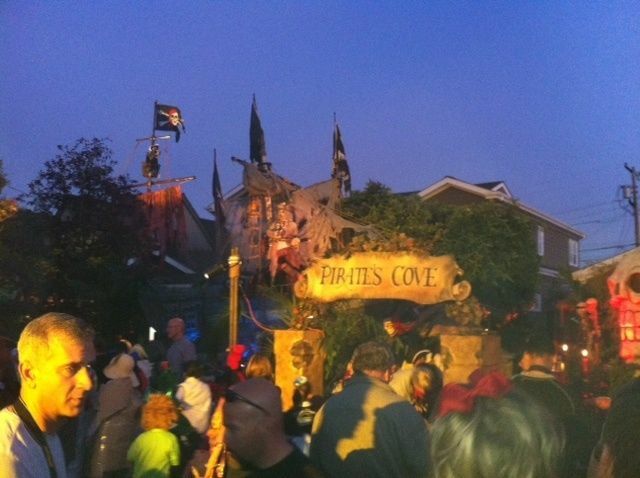 Packed with trick or treaters, Eucalyptus Avenue was ground zero for a true Halloween experience that has become a uniquely San Carlos experience. What has become more evident with each passing year is the number of trick or treaters coming not only from San Carlos, but Belmont, San Mateo and other surrounding towns. The reputation of Eucalyptus has grown well beyond the borders of San Carlos. ” I overheard many say that the Disney-like scene reminded them of Pirates of the Caribbean”? It WAS a replica of the black pearl. I guess you weren’t there? Or you haven’t seen the movie? Would love to thank the residents of Eucalyptus for a Great job … again. Thanks! Thanks for your comment. I think everyone who saw the movie realized it was a replica. Actually, the full name of the movie is Pirates of the Caribbean: The Curse of the Black Pearl. Additionally, Jack Sparrow is on the Disney ride, Pirates of the Caribbean…so that is probably where the comments were coming from. In any event, the comments were certainly full of praise. A giant thank you to Dave, and everyone else on Eucalyptus who puts up with half the Bay Area on their street during the holidays.